The winner and runners-up for the 2016 Jim Baen Memorial Short Story Award have been announced. Aimee Ogden is from Madison, Wisconsin, Jennifer Brozek from Bothell, Washington, and Ronald D. Ferguson from San Antonio, Texas. Judges for the award were the editors of Baen Books and special guest judge author David Drake. Stories were judged anonymously. The Jim Baen Memorial Award will be presented at a ceremony during the annual International Space Development Conference held May 18-22, 2016 in Puerto Rico. 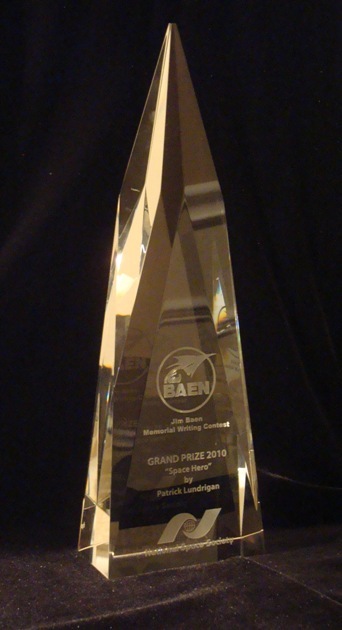 The winner receives a trophy and her story will be published June 2016 at the Baen.com web site, where new fiction is featured each month.